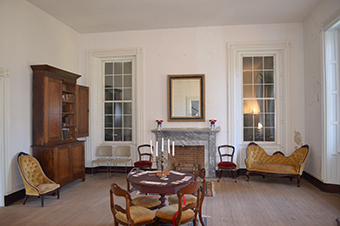 Under the care of the Alabama Historical Commission, Belle Mont has been partially restored and is furnished to reflect the pre-Civil War time period. The collection is comprised primarily of pieces from homes of that period in the Tennessee River Valley of North Alabama. Some furnishings and portraits are original to Belle Mont and belonged to the Winston family. The mansion’s two-story north entrance salon is flanked on either side by a formal dining room and parlor. Four bedrooms surround the rear or south courtyard, forming its U-shaped brick exterior. Belle Mont's outbuildings are no longer standing, but archaeologists located several foundations, including a slave house. Open Wednesday – Saturday, 10:00 am – 4:00 pm. Closed state holidays. Groups of 10 or more may tour the museum at other times by appointment, which should be made two weeks in advance. Please call Colbert County Historical Landmarks Foundation at (256)381-5052 or email info@bellemontmansion.org to schedule a guided tour for your group.